BsnTech Networks was contacted by Paul, the owner of A Blaze of Color. He contacted us late Saturday evening about a current website that he had. He was not happy with the site at all. Said that it was very bland and that he was paying for AdWords for his site. He noted that he was getting plenty of clicks and was paying a substantial amount, but he wasn’t getting any business because it wasn’t clear what his business really was! Someone he knew had created the site for him initially – which was a one-page site with a picture gallery of some of his work. But upon first look, you couldn’t tell what A Blaze of Color did as a business – unless you looked closer in the small text on the site. Paul was open to having the site completely re-designed so that it was eye-catching and there was no question about what business they were in. By the time we were done with the site, he was astounded at how fast the site was done and how professional the site was created. Sunday late morning he gave us the “go” to re-design the site. Less than 10 hours later, we had the site fully up on his hosting account with all of the changes made. Paul noted in an e-mail to us – “Boy, you get s**t done bro. Awesome. Took almost a year to get that last site going!“. We appreciate the business from Paul and he has already provided our contact information to someone else that needs a website. Hopefully we can earn their business as well. 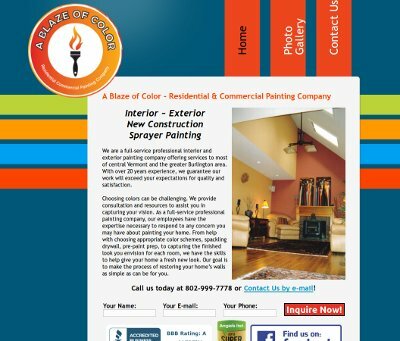 A Blaze of Color’s website is at ablazeofcolor.com.